A study of citations in four prominent journals indicates how deeply Hofstede's conceptualization dominates the understanding of culture in international business research. The implications of this intellectual hegemony for the development of the field are examined After considering some critiques of Hofstede's approach, three diverse alternatives to the value-based approach are discussed. Cray, D. (2007). 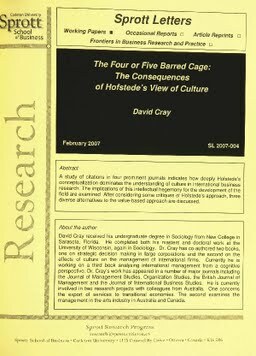 The Four or Five Barred Cage: The Consequences of Hofstede's View of Culture. Sprott Letters, February(2007).